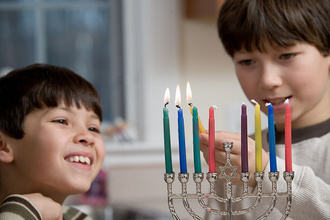 Here is a collection of the words for some songs and rhymes that coordinate with the popular early childhood theme Hanukkah, and can be used when planning activities and curriculum for Preschool, PreK and Kindergarten children. My dreidel I shall play. Sung to: "I've been working on the railroad"
To see them shining bright. Fill me with your glow. One jumped out, said catch me if you can! When I turned around it ran right out the door! Now, there are 4 little latkes. The latkes are frying in the pan, hurrah, hurrah! And we'll eat those yummy latkes on this Hannukkah night! Eat some latke crisp and brown. Starting with just one little candle, till all are shining bright. A miracle to light the night, and keep our people strong. On every night, a present. S'vivon (dreidels) to play with, and latkes to eat. To remind us of days long ago. Light the lights and give a gift. Light the candles one by one. Eat the latkes (pancakes), yum, yum, yum. Waiting to join the holiday glow. Filling the world with holiday light. Spin me around when you want to play. Just pick me up and spin again. Hanukkah is here, Hanukkah is here! Turning, turning, and falling down. Slower, slower - fall to the ground. I know there'll be some presents, too. There is one for every night. And with applesauce they're really fancy. Burning brightly throughout the night. We call that candle the Sha-a-mash. We play with dreidels and have some fun. Do we light? Do we light? We do light, we do light. I'm a little dreidel, can't you see? Spin my handle, and play with me. Spin me, spin me, round and round. Watch me, watch me, as I fall down.